In just his third year in the majors, young star Alex Bregman has done something that no other third baseman has ever done. In 2018, he has had a historic year and has become the first third baseman in history to hit at least 50 doubles and 30 home runs in the same season. In commemoration of this all-time major league record, we are proud to release this Marucci Alex Bregman Game Model Bat. 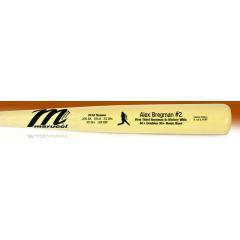 This is a Bregman Marucci player model bat; it is the exact dimensions, weight, and make of bat that Bregman uses in his games. The bat is laser engraved with acknowledgment of the record as well as Bregman’s final season stat line. Demand for this World Series Champion’s and All-Star Game MVP’s bat are sure to be high so order yours before they sell out! This bat is officially licensed by Alex Bregman.